Glasgow is the fourth largest city in the UK so it’s no surprise finding your way around can be bamboozling. To make it that bit easier we have helped to organise and list some free and special methods of transport for during Glasgow Doors Open Day and have also displayed some helpful websites for route planning. To help save the planet try to walk, cycle or use public transport throughout Glasgow. 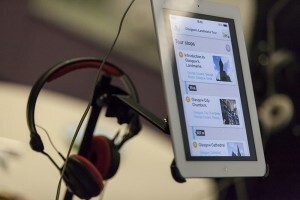 Remember you could download our free audio trail to listen to on your walks between buildings. Click here for more information. For information on public transport in Glasgow please see Traveline Scotland. There are a number of options when travelling throughout Glasgow; Bus, Train & The Subway. Find the best way for you. With locations all over Glasgow, why not jump on a nextbike? They are offering a free hour rental for all Doors Open Day visitors. Register at nextbike.co.uk and use code 536253 in the voucher section of your online account to claim yours. Or if you’re in the Southside, South West Community Cycles are offering free hire! Advance booking will be required and can be done by phoning 0141 632 7155. Remember to stay safe on the roads! Create a peaceful day by planning an interesting walking route around Glasgow. Try using Walkit to plan your route. If you are driving throughout the festival then you should find parking information on each of the event pages. Additionally why not check Parkopedia, a website that helps to find nearby carparks and street parking information. For getting to and from all venues on Doors Open Day, Glasgow Taxis Ltd will have its full fleet of licensed taxis on the road, providing an efficient and reliable service 24 hours a day, seven days a week. Taxis can be booked by calling 0141 429 7070 or using the Glasgow Taxis Ltd iPhone, Android & Windows apps. There are no boundary charges for all bookings made via phone or app.